If your looking for a high performance rebuilt engine that offers reliability and speed then look no further than to Medina Mountain Motors in Creston, Ohio. Whether it's Chevy, Ford, Chrysler, Imports, Boats. Medina Mountain Motors takes creative pride and stake their reputation on every engine we build. Medina Mountain Motors is committed to giving our customers a top of the mountain competitive engine that is durable and affordable. 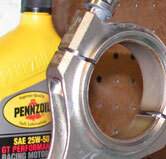 Whether the engine is new or re-built we strive to give you the best performance engine around.